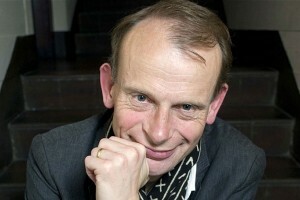 Andrew Marr is the host of The Andrew Marr Show on BBC　One, the agenda-setting interview programme. His first edition of the Sunday morning show was broadcast on 11 September 2005.He moved to the programme after a five-year stint as Political Editor at BBC News. Andrew also presents BBC Radio 4’s Start The Week each Monday morning. He was born on 31 July 1959, in Glasgow, Scotland. He gained a BA in English from Trinity Hall, Cambridge. Andrew joined The Scotsman as a trainee and junior/business reporter in 1981 and became parliamentary correspondent in 1984 and political correspondent in 1986.He worked for two years at The Independent, then returned to The Scotsman as political editor in 1986. He moved to become political editor at The Economist from 1988 to 1992 and then returned to the Independent as chief political commentator in 1992 and was promoted to editor in 1996. Andrew has had five books published: The Battle For Scotland (Penguin, 1992); Ruling Britannia (Penguin, 1996, 1998); The Day Britain Died (Profile, 2000); My Trade (Macmillan, 2004); and A History Of Modern Britain (2007). He has received more than a dozen major awards for writing and broadcasting – including from BAFTA, the Royal Television Society and most recently the Broadcasting Press Guild, which awarded two prizes for The Andrew Marr Show and Andrew Marr’s History of Modern Britain.